What the heck is going on at North Park? North Ridge is a mess! I can’t figure out where I’m supposed to go and there are flags everywhere and now the little maps are gone. Do they even have a plan? 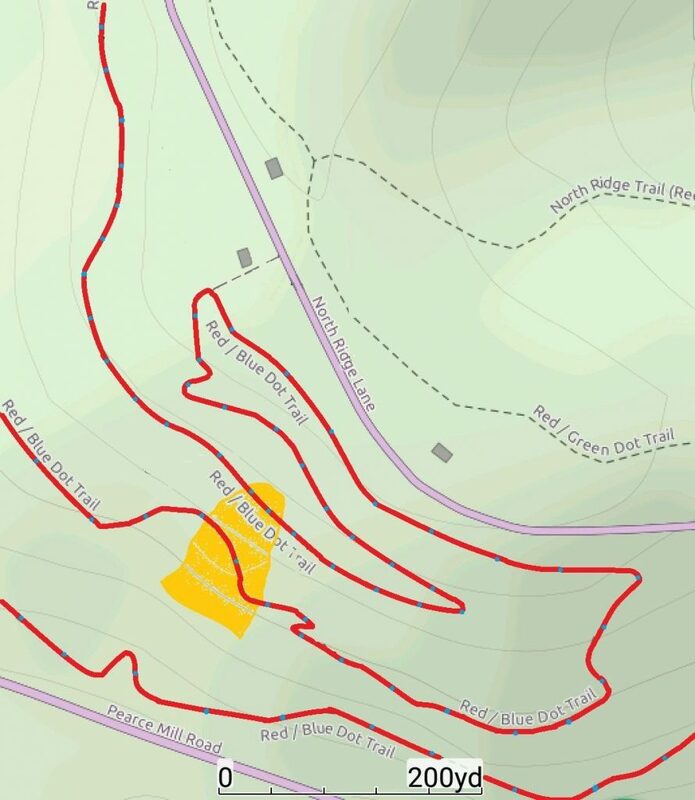 Here’s the quick version of the plan if you don’t want to read the whole thing: Build reroutes to reestablish a continuous single track trail from the ice rink to the spillway while avoiding the landslide area by Summer 2019. Minimizes intersections for easy navigation. You don’t want to have to write a novel to describe a ride or hike to a friend. 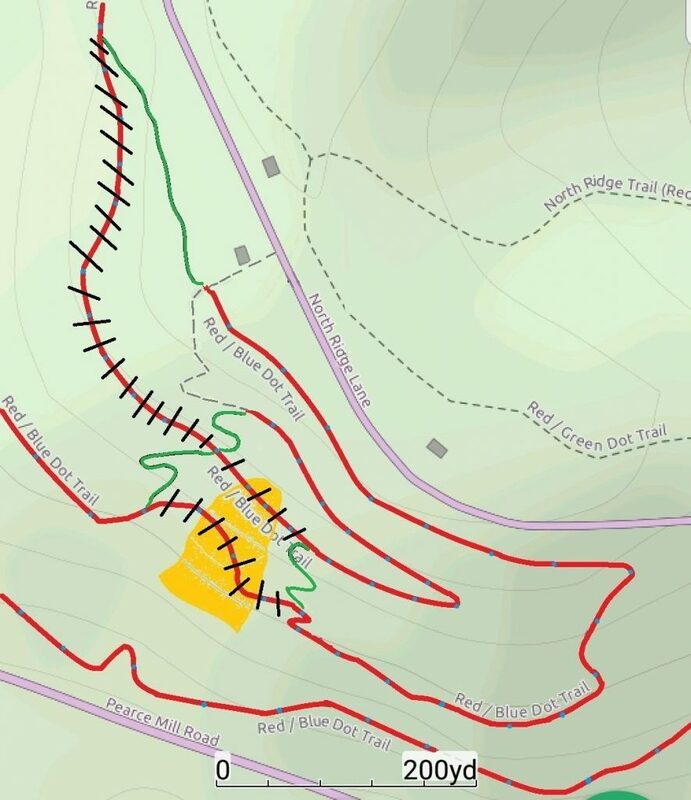 The final trail system on North Ridge includes Olympia Climb/Rainbow Ridge/Pfundstein (collectively the red with blue dot trail) to create a continuous single track trail on the SW face of the ridge. The landslide area may continue to shift over the years, so the rerouted trail uses some of the original Rainbow Ridge pine loop to cross above the landslide. There are few intersections to make navigation easy and create as much of a continuous trail experience as possible. The existing access trails to the road remain so users can create loops of varying length. A full trip across the ridge will be very similar to the old system. Starting from Olympia Shelter, the Olympia Climb to Rainbow Ridge is the same as always (red with blue dot blazes). Continuing on, the trail is the same until the first reroute section starts ~0.25mi from Wisconsin Shelter. As of Jan 2019, this reroute is not open but will be by the summer. This segment will bring users to Wisconsin Shelter and the start of Pfundstein Trail (all still red with blue dot blazes). Once near Wisconsin Shelter, users can continue onto the start of Pfundstein, cross North Ridge road to the Red Bridle Trail, or take the connector trail to lower Pfundstein. Continuing on upper Pfundstein (red with blue dot), the trail goes downhill to the powerline and climbs toward the landslide. A new set of switchbacks brings users to the pine loop that was originally part of Rainbow Ridge. This takes you above the landslide to a new section that links to lower Pfundstein. 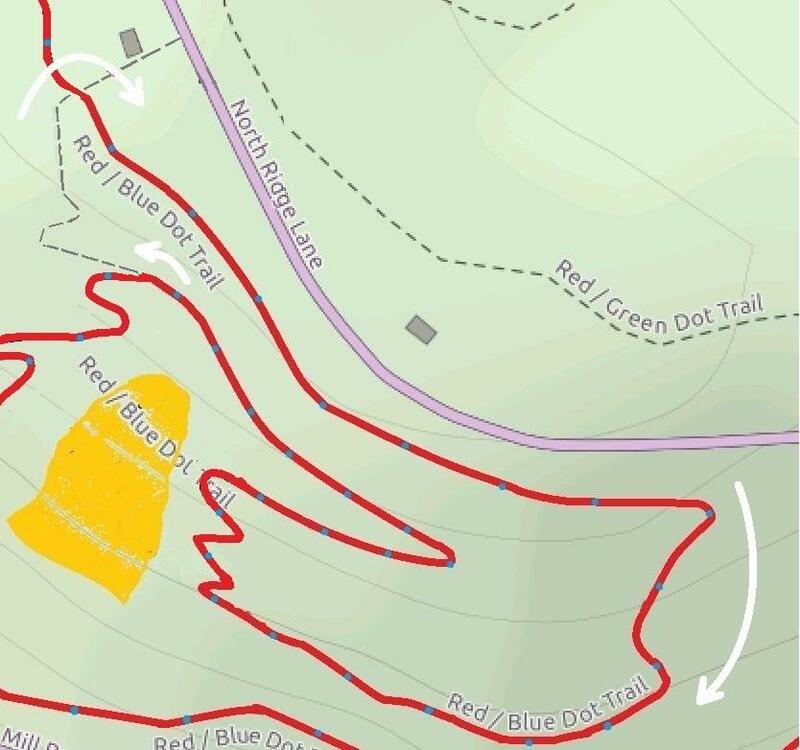 From this intersection, users can continue on the new set of switchbacks to lower Pfundstein (staying on red with blue dot), or go up the existing trail that was originally the end of Rainbow Ridge to Wisconsin shelter. The existing blazes on this section to Wisconsin will be removed since it will not be part of the main loop. Only the lower section of switchbacks to get to lower Pfundstein are open as of January 2019. There is no change in the trail from the bottom of the new switchbacks to the end of the trail near the spillway. Start at Olympia shelter near the ice rink as usual. 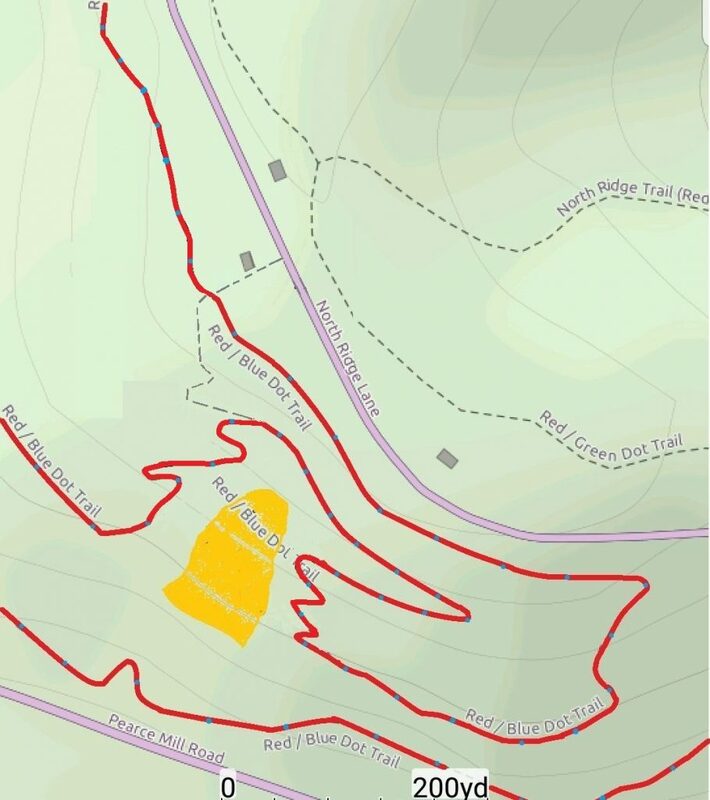 When you get near the landslide, either bear left onto the temporary trail above the landslide and then continue as usual to Wisconsin shelter, or turn right to go down the new switchbacks to lower Pfundstein and the spillway. Once you get through upper Pfundstein and the new switchbacks on that side of the landslide, the same temporary trail above the landslide will get you to the new switchbacks to lower Pfundstein. That’s the plan! With some good weather and volunteers, we’ll get this put together in time to enjoy before summer.